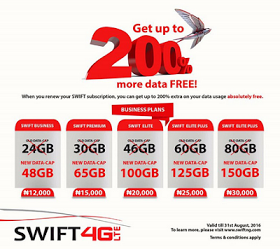 Swift 4G LTE is now offering 200% extra data to all their data subscribers. This offer is indeed a good one for those looking for loaded data for their company or personal business. Anyone can go for it and another thing about 4G LTE is that, the network is so fast when blazing with it on internet surflings. This amazing offer was announced on Swift 4G LTE Facebook page few hours ago, so that means it is on and open for everyone. Although I regard it to be costly for personal use but that doesn't matter, if you have the money for buying the data, you have nothing to loose because, everything is standardized when you talk of swift 4G LTE. Below are they packages and their prices. READ ALSO: How To Browse Freely With Airtel 2G Subscription Data Plan On 3G Network Mode. The offer is Valid till 31st of August 2016. Don't forget to share to friends using the below share buttons.